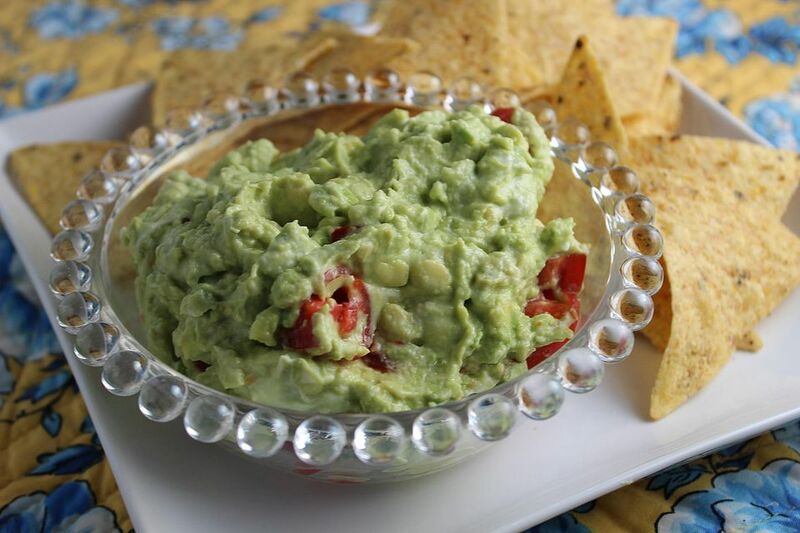 Guacamole is a classic appetizer dip recipe, made special with a few secret ingredients. Be sure to read through my Step by Step instructions before you begin. It's not difficult to make guacamole, but there are some rules to follow to make sure you have the best result. First, the avocados. Finding perfectly ripe avocados in a grocery store is about as easy as finding roses in January in Minnesota. So you have to plan ahead to make your guacamole. Buy Haas avocados - the ones that are dark green with a pebbly skin. They have the best texture for guacamole that isn't too thin or watery. Then make sure that you use lots of lemon juice. Avocados darken in just a few minutes after they are cut and exposed to the air. Sprinkle lemon juice over the avocados after you have removed the flesh from the skin and put it in the bowl. I always add more lemon juice after the avocados are mashed because I like my guacamole lemony. Serve your perfect guacamole with tortilla chips. I like using the chips that are coated in cheese for even more flavor. Squeeze the fresh lemon juice and combine in a medium bowl with the salt and cayenne pepper. Then cut the avocados in half and remove the pit. Cut the halves in half again and gently peel off the skin, or remove the pit by striking it with a knife, then use a large spoon to scoop the flesh from the skin. Add avocados to the lemon mixture; mash with a potato masher or a fork, leaving some of the fruit (yes, avocado is a fruit, even though it is classified as a vegetable in stores) unmashed. Stir in sour cream until the mixture is blended, then fold in the chopped tomatoes. Cover the guacamole with plastic wrap, pressing the plastic wrap directly onto the surface of the guacamole, and chill for a couple of hours before serving. It can also be served immediately with chips and crudites.